That link is not working for me. Can you repost it please? most supporters is very low too. I used to belong to the local Monarchy group but my views have greatly changed over the last years and I totally agree with the comments. He has his wedding ring on here. The comments are scathing; accusing him of not having a real job and wasting all that money getting married to a z lister hag. He’s going to have a very hard time getting people past this and to look at his charities. Right now, he’s finished and people are bringing up his partying and drug use and his out of control private life. Unfortunately that might be true because look at the mess he’s now married to. Oh please, since when did Harry and his brother have "real jobs." I hope a fake ambulance job is not created for Harry. I don't see Harry as "finished" he's doing what is par for the course for the young royals. I don't see Meghan as a mess, and Harry is popular and I never saw him as "out of control." He was labeled the "bad" brother while WIlliam got away with commandeering helicopters and getting drunk. The forums and blogs are full of disdain and criticism for the Diana spawn. I am sorry to say dork haza has really painted h himself into a corner with strumpet murky. Yes, I agree, the young royals are doing what they do best - nothing other than partying and living off the taxpayers, hitching them selves to two vile families they have brought into the rf, dragging the rf down to the sewers, gutters far too high for them these days. Starting with the next generation down, her own children, the rf are nothing but a load of serious scrounges out for all they can do to scam from taxpayers and live the high life, doing their own thing, boozing and taking "medication" with hordes of flunkeys picking up the mess they make. If a true poll were taken, and I mean true, not manipulated as usual, then the truth would come out that haza is not well liked and has gone down to zero in the opinion of many people. Can´t read an article these days without the comments section pulling him to pieces at what he has done by marrying murkle. Haza has been well out of control over the years, appearing to a fancy dress in a Nazi outfit. Strutting his stuff naked in the US with a bevy of girls, photos of him drunk and medicated stumbling from unseemly nightclubs. If that does not suggest that he was, and still is by marrying murkle, out of control then what does. The press do not get to print the half of it, that is the trouble, and what the public knows he has got up to is, in the opinion of many, including myself, the tip of the iceberg. Sorry, we will have to agree to disagree on this one, no way do I feel haza is, or ever will be, in control. I hope that Harry does not get the fake job like his brother had and fortunately left. I don't see how Harry was out of control at least he apologized for his stupid actions that you cited , Will OTOH was coated in teflon and protected. Charles had to apologize for what he did at least twice. I think both are spoiled. One thing the Queen needs to do: is to hand Will and Harry and their spouses a list of duties and expect them to complete them or no perks and privileges allowed. I am tired of the laziness. I want both to step up to the plate. Harry showed exactly who he is by the way Mutsu was treated at the wedding. They ran an entire redemption campaign on that young man's back. Sold the public on them being close, him personally sponsoring his family. It's been years and whenever things seem to be going sideways for Harry, they pull this kid out of their back pockets. All of this yet he was made to stand outside amongst the rent-a-crowd. I wonder if they even saw fit to give the kid one of those cheap bags with the bottled water in it. Harry has done a lot that can be forgiven and no one expects him to be infallible. He is human after all. But this? This I can't get past and any respect I had for him is gone. He's a user. ^ My thoughts exactly, when they showed the kid in the crowd (and all the bs sugray headlines how good Harry spotted him and greeted him - from 10m away!!! they made it sound as if H went to him and shook his hand ffs) I couldn't believe my eyes. So many headlines how he'd be invited to the wedding, I expected him in the church, not outside with the other anonymous sheeple. And then H's all hailed "greeting", yeah all the plebs were greeted that way. Poor kid probably thought he'd have the time of his life but was sidelined like all other dirty plebs and blatantly used for H's image. Yeah Harry's done some real shyte, some can be forgiven, as you say we're all humans and no one is infallible, but that was class A shittery on a whole other level. That struck me quite a bit and made me think for ages, I either forgot to mention it here or it was buried under the frenzy. What a shame but at the same time, i’d rather him stay outside instead of inside witnessing that bs of a wedding service. This poor chap was also said to have written to Harry for years and never received a reply. At the time, I thought that was the press trying to make Harry look bad. I just don’t know what to think of Harry any more. I’ve heard from people that’s associated to him that he’s out of control but I’ve also heard that he’s not as bad and crazy as people say; that he’s quiet and intuitive. Anyway, my pet peeve is that he’s been given a position from the queen to help the youth in the commonwealth. He’s alluded to not liking what social media’s doing to the younger generation but yet he’s married to this fame wh*re user who’s generating dumb clickbait articles and has young women of colour defending her and feel that she ideal for her role. Apparently, Harry did have his ring on when he left the gym. So much money wasted on this whilst London’s crime goes up because of cutbacks to the police and the homeless people can’t get housing because of gentrification and foreign investors and the councils selling off their land and housing because they’re broke. It’s a mad world to say the least. ^ Even more proof that he doesn't give a flying f about Mutsu, if Mutsu wrote to him for years and the poor kid never received a reply. The conflicting reports are quite sth, those are around about every Winds, but usually you can easily suss out the truth by looking at the source. We have plenty of reports of K being a bytch, but also some of her being very nice. The "very nice" ones usually come from her engagements, which negates their credibility; inside sources plus K's behaviour towards other women and similar very much prove the "she's a bytch" ones as right. So with H we have to look at the source and surrounding circumstances. The problem though is also that it's easier to determine with Bill, b/c H is regularly thrown under the bus for his brother. It's a bit difficult, because in that sense reports about Bill can be more consistent. With Harry you might have to look a bit closer. I believe the "wild" reports, also that he's careless with people, if he were so warm and cared so much he would have treated Chelsy better (eg not picking her up from the airport, cheating) and Cress as well (wouldn't take her to the US wedding or pay for her flights, what a millionare gentleman). If he treats his GFs that way, then what does a poor kid from Africa really mean to him on a day to day basis? Fly in, do a bit of work, hug and go back home. Write personal letters back is, well, personal, and requires extra effort and caring. His new wife the Duchess of Sussex has not accompanied him for his short trip to the country. 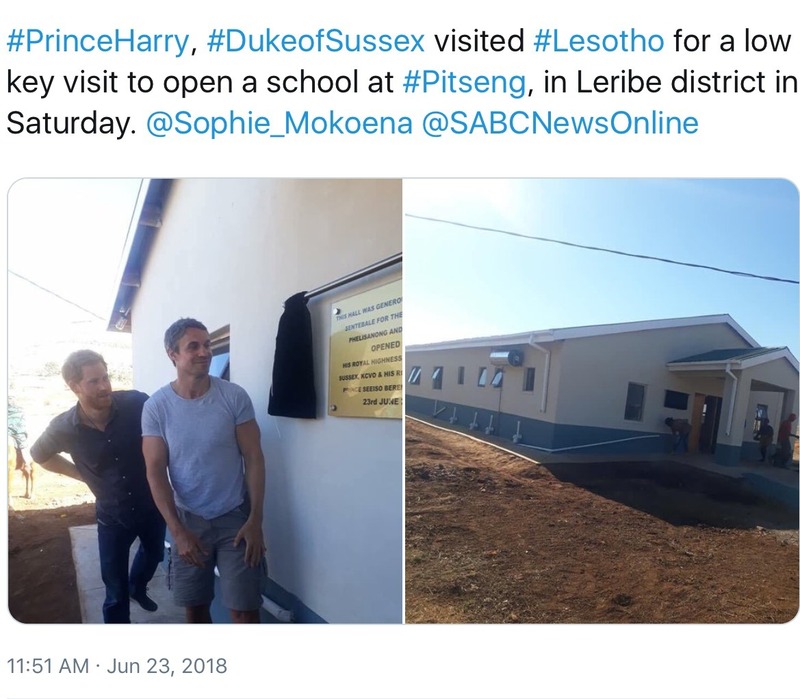 Kensington Palace confirmed that Harry is on a 'private visit' to Lesotho, which is connected with his work with Sentebale. The Duke was also joined by friend and Sentebale ambassador Adam Bidwell on the visit. ^very strange that Megs didn't go with him. I doubt she would want to miss a photo op as an "humanitarian" with Africans. Oh, but it's Harry's humanitarism on display, not hers. Harry told her a$$ to stay home! ^ I agree. This type is thing is supposed to be one of her strengths, isn't it? That said, I'm glad she's not there. Like his brother, he appears happier and more relaxed at events without his wife. 'private visit' Is he paying for it privately then, or putting it on the taxpayer tab. I think we can guess which it is. Why Meghan Markle didn’t join Prince Harry in South Africa this weekend - where was she? Prince Harry was in Lesotho for the opening of the centre’s new dining hall, helping to support and feed vulnerable children in the area. Meghan is also known for her philanthropy, with the couple revealing in their engagement interview in 2017 that charity work helped them connect. Harry made the flight alone last Thursday, just two days after appearing with Meghan at her Royal Ascot debut. Basically they’ve no idea why she didn’t go with him. Her pr excursion to Africa and India is what made them connect. She’s ditched all that faux caring now she has the ring. No need really to waste her time sleping around the poor and less fortunate when she can hang out with her new bestie, the queen, and hobnob with the highbrow set at Ascot. It is not uncommon for royal couples to do separate engagements even early on. I think it is following the same pattern that was used for William and Kate (right down to Kate's engagement with the Queen). ^ You're right about that, Sandy. However, this is a charity that is near and dear to Harry. I would think he'd be excited to show it to Meghan and for her to meet the people that are a part of it.